Last time: after Darkseid banished the Infinity Man, Desaad imprisoned the Forever People in the amusement park/concentration camp Happyland in a variety of cruel deathtraps, but their Mother Box escaped and sought help from a stranger named Sonny Sumo. 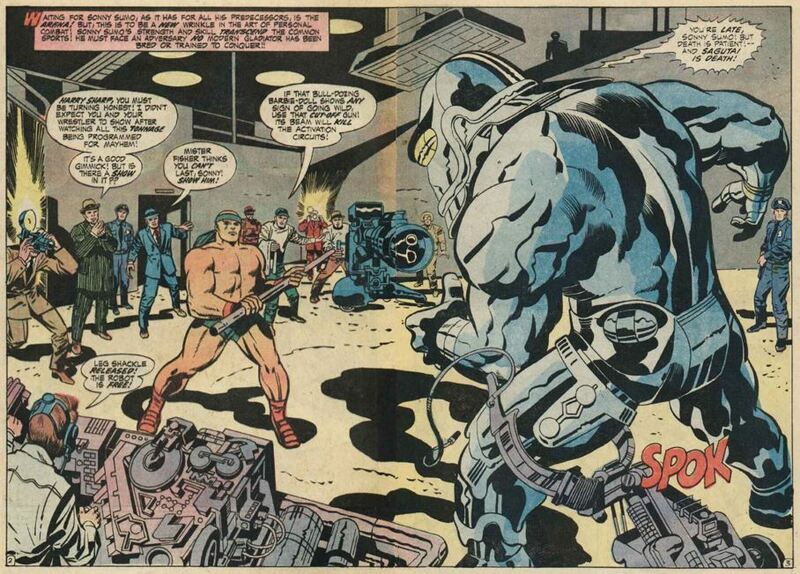 Sonny Sumo is a Japanese guy hoping to make a name for himself in Jack Kirby’s version of pro-wrestling by fighting a giant, flame-throwing robot with swords for fingers. 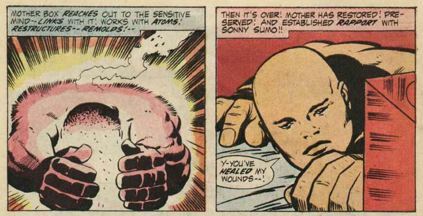 Crazy Mother Box stunt of the week: healing Sonny’s third-degree burns. 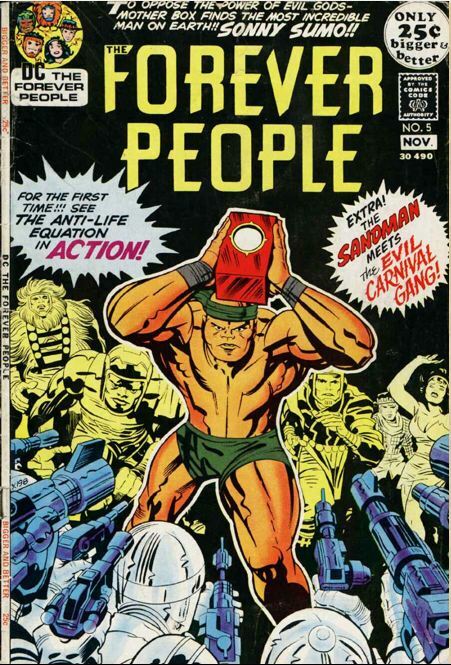 Eager to prove himself against a real challenge, Sonny agrees to help Mother Box rescue the Forever People. Which he does with astounding ease, making me wonder if that’s because Sonny Sumo is just that awesome, or the Forever People are just that inept. 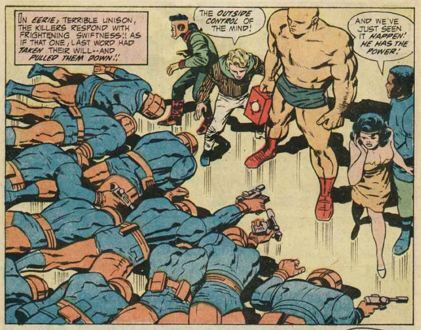 When Desaad’s guards show up en masse, Sonny Sumo mind-controls them . . . via the Anti-Life Equation! Sonny Sumo’s the guy Darkseid has been searching for, lo these past five issues! what’s the story with sonny sumo? 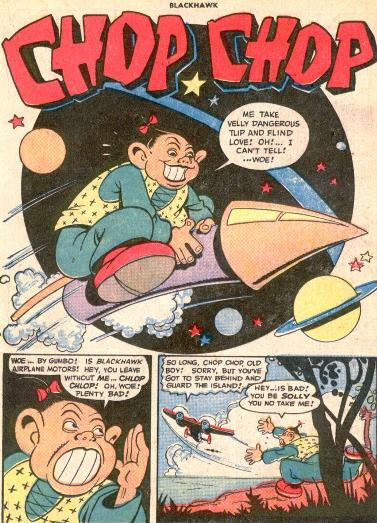 Kirby came up with Sonny Sumo when Marvel Comics letterer Morrie Kuramoto started giving him some good-natured grief about creating an Asian super hero, since Kirby and Lee had created the first mainstream African super hero with the Black Panther. 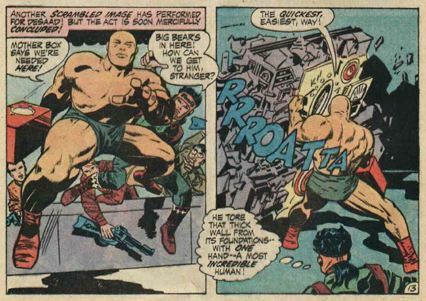 That said, Sonny’s clearly the hero of this story, and he’s depicted in a way that’s both stoic and sarcastic, calling Big Bear “bushy-beard” and speaking in contractions in a time when a lot of Asians in comics were excessively formal. He ain’t no Chop-Chop, is what I’m saying. 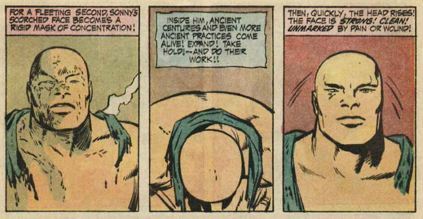 This kind of thing was unfortunately par for the course with Asians in comics back then: you’re either an honor-obsessed madman, a devious Oriental mastermind, a superstitious peasant, a powerful mystic, or a Judo master. Sonny Sumo doesn’t rise above those stereotypes, but it’s clear that Kirby meant to create a sympathetic, effective hero. Yeah! First of all, when the Forever People ran into a serious problem, Mother Box went straight to the one guy on Earth who has the Anti-Life Equation locked in his head. Surely that’s not a coincidence: Mother Box knew this from the start, and is therefore more clever than Darkseid or Desaad. What does it mean that Sonny Sumo has the Anti-Life Equation in his brain? Hell if I know! Earlier in the issue, Sonny demonstrated sufficient willpower to reject his own injuries. His desire to test himself against adversity isn’t a compulsion to battle, like Orion’s case, but rather a deliberate decision to set aside his instinct for self-preservation in order to confront new challenges. Maybe that selflessness and iron will give you command of the Equation? Who knows? Though Sumo’s role here is a little fuzzy to me, there’s some fun stuff about the Anti-Life Equation, free will, and destiny. Check it out: there are “many other” all-powerful cosmic equations. Also, the Forever People give a pretty good explanation of their mandate: they believe that everyone should do his or her own thing, and are fighting the Blue Meanies who won’t let people live how they choose. What does Darkseid think about this? Everybody’s got their own nature, and everything they do will express that nature. 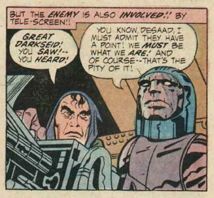 Darkseid explains: “It’s the very core of our conflict! To fulfill ourselves—we must kill them!” I love that! If you take the Forever People’s just-be-yourself motto to its fullest conclusion, you’re going to get a sociopath like Darkseid eventually. Darkseid’s villainy is simply his karma in action, and while he may regret the circumstances, it is his nature to do anything for power and he won’t fight that urge. 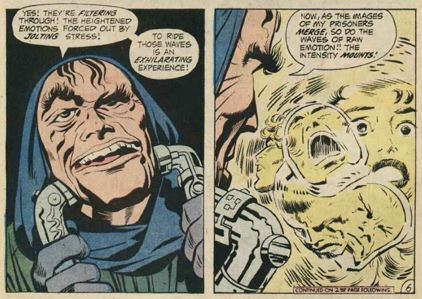 I’ve been thinking for the past week or so that Marvel Heroic Roleplaying might be a better fit for Kirby’s Fourth World saga than my beloved Marvel Super Heroes, in part because it handles laughably flexible (i.e., totally deus ex machina) power sets like Mother Box much better. Sonny’s a character who would work very easily in Marvel Super Heroes, but I’ve got this other game on my mind right now. Probably the SFX and Limits could be better designed. Still getting a feel for this thing. SFX: Anti-Life Broadcast. For each additional Mind Control target, add +1d6 to your roll and keep +1 effect die. SFX: Chi Focus. In a pool including a Mind Over Matter trait, replace two dice of equal steps with one die of +1 step. SFX: Second Wind. Before making a roll involving a Mind Over Matter die, move your physical stress die to the doom pool, and step up your power trait die by +1. Gain 1 XP the first time you use Mind Control power trait in a scene. 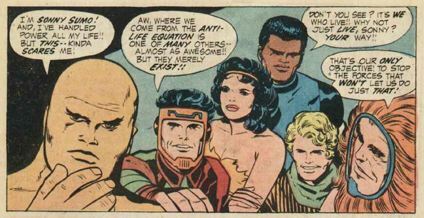 Power: Anti-Life Equation. This is Mind Control at Amazing rank. It costs 10 Karma points to use this power. Power: Mind Ritual. This is Regeneration (or, in the Advanced rules, Recovery) at Incredible rank.